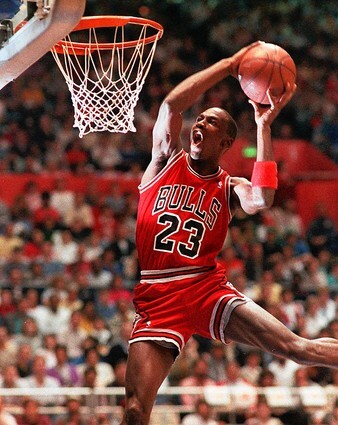 There is no cooler feat in all of sports then the slam dunk! In any given NBA arena, 95% of the crowd is almost exclusively there to see someone get posterized. A well timed dunk can change the course of a game and make everyone forget that a player’s gone 1 for 13 from the field on the night. When any two high-school teams square off, the only thing running through each players mind is how many dunkers the opposing team has. My team had 2; myself and another guy (although I could only do it in warmup. By the time the game started, my legs were too tired. Warmup, however, is the most important “intimidation time” because it’s when the other team is watching). Remember as a kid when you played on your first lowered 7′ hoop? The moment you took off, feeling for an instant that you could fly, hanging in the air longer then humanly possibly and then throwing down so hard that you couldn’t help but let out a primal scream! The artistry of Picasso combined with the ferocity of an injured grizzly bear. This entry was posted on May 25, 2010 at 10:18 pm and is filed under sports, sweet videos. You can follow any responses to this entry through the RSS 2.0 feed. You can leave a response, or trackback from your own site.